Founded in 1986 to provide high quality and unique home furnishings, Arhaus imbues its products with a philosophy of excellence, sustainability, and international flavor. Founders Jack and John Reed opened the first Arhaus location in a 19th century brick building located in the Flats District of downtown Cleveland. Today Arhaus has grown to almost seventy locations across the United States, each offering a unique collection of furniture for your home. Arhaus stores provide an opportunity to display each piece the way it would be found in a home–retail is theatre, and Arhaus showrooms are the stage for design to shine. Arhaus partners with manufacturers all over the world, building relationships directly that have lasted for decades. The Arhaus philosophy is to grow with partners, ensuring the highest quality of products from trusted manufacturers. Many Arhaus pieces are designed and manufactured directly in the United States. The Live Edge is created in collaboration with Amish sawmills; each slab of timber is collected through a sustainable harvesting process, then handcrafted into a massive tabletop that provides unique beauty to any room in your home. Many of Arhaus’ upholstery pieces are created in North Carolina, building frames from Sustainable Forestry Initiative-certified Georgia Pacific wood and sewing fabric & leather in North Carolinian facilities. With sustainability as a core tenet of the Arhaus philosophy, Jack and John Reed made a pledge when founding Arhaus to never use wood from endangered resources. Today Arhaus utilizes sustainable certification programs, sources sustainable wood, and reclaims metals such as copper to recycle discarded material into new tabletops. Partnering with organizations such as American Forests, Arhaus has given back to the environment, planting 25,000 trees–one for each purchase during the annual storewide sale. The Town Center Plaza Arhaus is located between the Bristol Seafood Grill and On the Border restaurants. Featuring 17,000 square feet over two stories in a freestanding building, the Leawood Arhaus exhibits exclusive Arhaus designs, custom furniture, and staged showroom areas designed to showcase how Arhaus furniture would be arranged in a home. The building itself provides an industrial look for the interior while windows and skylights flood the showroom floor with natural light. 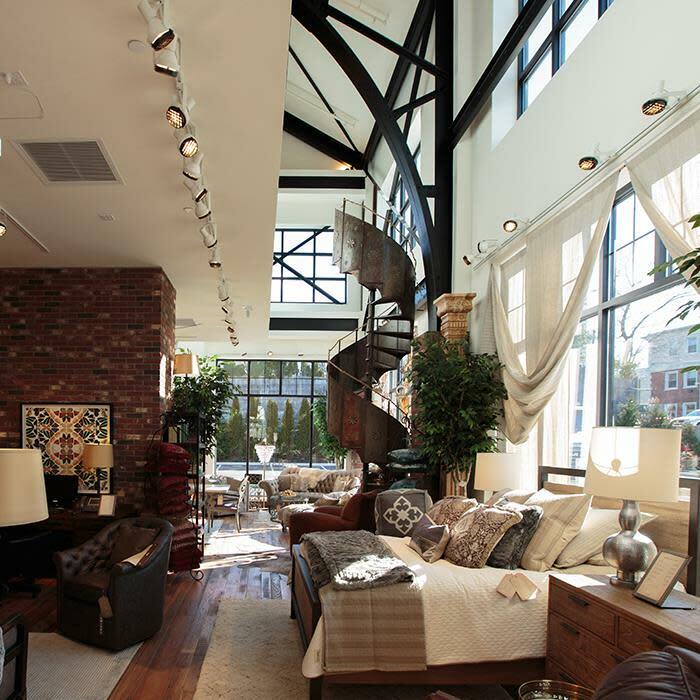 Each Arhaus location offers exclusive pieces, including Arhaus relics and one-of-a-kind antiques. Stop by the Leawood Arhaus today and explore a vast collection of furniture, decor, and unique pieces from around the world or find Arhaus on Twitter for the latest looks and news.